I think I'll keep this as a simple list rather than go into details about why they are my top 10; that way I'll be able to come back occasionally to share some part of what made these books my top 10 in 2010. I'm ashamed to say only two of the books were actually published this year, which just shows how much I cling to old books. Maybe early in the new year I'll do a list of strictly-published-in-2010 books. Charles Simic's A Wedding in Hell...and that's it for now! The second e-book will be all love poems and will be out in early January. It will also be free-ish. Enjoy! when a poet launches into a 3rd successive poem about the 3rd eye. I'm here to talk about/to those who patronise those poets. and nobody can tell you how to get in touch with your own spirit. You don't need a 3rd eye to see that!! 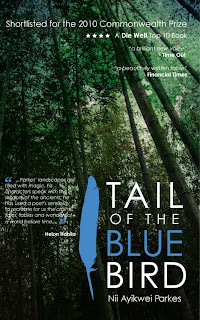 I have already sent a newsletter recently to let people know that my novel, Tail of the Blue Bird, although officially released in the US on January 13, 2011, will be delivered by most retailers in time for Christmas. However, for people who need more assurance, I have arranged the option to sell copies directly at a discounted price of $10 (instead of $14) and any copies bought through me - by clicking on the button below - will be delivered to US shoppers by Christmas - as long as they are ordered by December 16, 2010. The payment will be to a PayPal account, The Writers' Fund, and the difference between by author discount and the $10 price will be used in the work I do through The Writers' Fund in Ghana to support writers and writing initiatives. Thank you for your support and readership and I wish you a great Tail-of-the-Blue-Bird-reading Christmas! I was recently interviewed by Henry Bonsu on VoxAfrica in relation to my new book of poems, The Makings of You. It's a long programme and I appear in the last half hour so do forward if you have to. Enjoy! I've become a useless doting dad. All the hustle, travel, reading, performances and (gulp!) even the writing, everything has settled to a simmer in my life and the only thing popping is Little-Miss-Daughter who (I kid you not) is amazing! She's 20 months old and already she's having conversations with me in Ga and English and scolding me (no more, Daddy, no more!). I used to think my mother was making things up when she told me the really complicated things I am supposed to have said at the age of three, but I'm beginning to believe. The human mind is truly, truly amazing! What I can't get my head around is the fact that we lose pretty much all our memory of events up to the age of 3/4, but we don't forget the things we learn e.g. language, whether or not to be afraid of dogs etc. etc. It's mind-boggling. Anyway I'll bore you no longer with Daddyhood. The good thing, with hindsight, is, I did so many sleepless nights BEFORE my daughter was born that it seems I will be releasing new work until I finish the next project. In the meantime, here are some updates. Tail of the Blue Bird was selected by Writers' Centre Norwich as one of their Summer Reads and right through the year it's been promoted in local bookshops and libraries, which has been amazing. 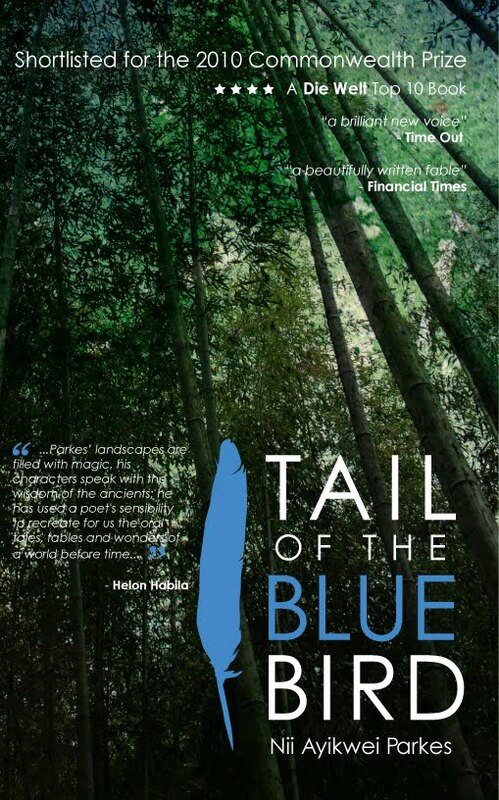 The initiative is now coming to an end, but until the end of August, Tail of the Blue Bird is being discussed online as well as at a special Tail of the Blue Bird Book Club Session at Writers’ Centre Norwich, 14 Princes St, Norwich, Tuesday 24th August, 6pm. To join the online discussions, just go the the WCN Facebook Page. You can even check out their reading guide. Now, book news - or new books news :) I mentioned the release of a Dutch version of Tail of the Blue Bird and I can confirm that it is now out and selling well (you can see it on the publisher's website) and so is the German version (also on the publisher's website), which has had a couple of decent reviews this week [Links: Die Spiegel | Watching the Detectives ]. Well, I'm guessing that they're good because I couldn't make real sense of the automatic translation! I have also now held in my hands a physical copy of my children's book The Parade (pictured on the left) and I can assure you that it feels good. Plus I am assured that I will receive in tomorrows post a few copies of my début full poetry collection The Makings of You. I am giving five copies away, so the best five pleas I receive detailing why you should get a copy in tweet-length (i.e. text or 140 characters) will get them. I'll reveal the winners at the end of the month :) Of course, this doesn't mean don't buy the book - I need you to buy it so I can earn some royalties, but you can flog the one you bought if you win! And finally, drum roll... the long-awaited US release! It is still long-awaited, the release date has been pushed back to 20 January 2011, but you can now pre-order it on amazon.com or BN.com AND I will be coming to the US in January/February for a whole month to promote it (with the other two books, of course!). My first reading/signing is likely to be in Rochester, NY but I'm still trying to fix dates so if you know of a local bookstore or college/university that would like to have me visit/sign/read/teach and it's on the East Coast, please contact me so we can work something out. Not many people have seen what the entire cover will look like, but... eyes-left - voila! You're the first, my fans, my everything! Cook and drain the spaghetti/pasta (preferably al dente) and leave in a bowl. While the spaghetti/pasta is cooking, wash the spinach, chop the garlic and onions and place to one side. Heat the sesame oil in a frying pan, sauté the garlic for a minute then throw in the spring onions (I tend to cut them prawn size and like them tender but you can always add them later). Add in the prawns and stir fry the contents of the frying pan for a minimum of three minutes (make sure the prawns have turned pink) adding the spinach in the last minute. On hot days I let the dish cool and eat it with fresh chopped tomatoes. On standard English days I eat it hot with sun dried tomatoes. I tend not to use salt (especially when I cook seafood), but I do use loads of fresh ground black pepper/corns. I admit; this is not really a blog. It's a not-very-faithful-copy of my e-newsletter, but it's all I have time for at present. Anyway, I come with good news... great news: the release of the Tail of the Blue Bird mass market paperback in the UK, release of the Dutch translation, release of the German translation, availability of SIGNED copies in Ghana and the imminent release of a US edition (all in Book News below). I also have three really cool events coming up - the first in relation to the Michael Marks award that I've been shortlisted for, the others with the fabulous Booktrust and Writers Centre Norwich. The details for those are just below in the events section. Monday, June 21, 2010: Summer Reads (Norwich) - the Writers Centre in Norwich has included Tail of the Blue Bird in their Summer Reads programme (more here) in which six books have been chosen as Summer Reads Book Club books. There is even a book club session in August for Tail of the Blue Bird, but before that I will be reading at a live event with Naomi Alderman and Mick Jackson. It starts at 6.30pm at the world famous Norfolk and Norwich Milliennium Library and it's ONLY £2 on the door: full details and tickets online. Follow Writers Centre Norwich on Facebook or Twitter. The UK mass market paperback is out and on shelves right now generally ranging from £5.99 on amazon and Foyles to the full £7.99 on waterstones (although they have free postage!). The lowest price, surprisingly, is £5.59 at WHSmiths! If you're in Ghana, you can get signed copies of the mass market paperback exclusively at SyTris Books on Spintex Road for just GHC15. They also have copies of the trade paperback at GHC25. Dutch: The Dutch release of the book hits shelves this week in the Netherlands (you can see it on the publisher's website). I have one free copy to give to a Dutch speaker - drop me an e-mail and I'll get it to you! German: The German release of the book (published by a Swiss publisher) also hits the shelves in a week and can be seen on the publisher's website. I don't have any free copies yet, but look out! In the USA: A version of 'Tail of the Blue Bird' is set for release in the USA in September (full details to come) so if you know of anyone who would like to review it for a local paper etc. please put them in touch with me now and I will arrange for them to get copies by mid-July so we can drum up some HEAT for the long-awaited US release! TWO - I found a new, short but lovely, review of 'Tail of the Blue Bird' in the current issue of World Literature Today that 'got' some of the politics behind my aesthetic choices. Good times! One of the most curious attractions of Tail of the Blue Bird is its privi­leging of Ghanaian languages over English. Nii Ayikwei Parkes tells a wonderful narrative where all the "English" words are italicized and the Ghanaian words of Twi and Ga are not: "It was black and shiny, but when the tall red policeman stepped closer it was wansima, about apem apem thousands." This in itself sets the book apart, and yet it is a revolu­tionary publication on other levels, too. Parkes has insisted on the use of phonetic script to capture the sounds of Ghanaian English—kєtє, sєbi, Asєm bєn ni!—and interestingly offers no key or glossary for the non-Ghanaian reader. In terms of con­tent, the book marks a moment in time when the postcolonial novel is leaving the stage; there is no "apolo­gy" in this narrative, nor is there any great sense of problematic opposites. Things in this book are very much "as they are." Set in the hinterland of Ghana, the protagonist, Kayo, is "persuad­ed" by the Ghanaian police force to leave his comfortable forensic labo­ratory job in Accra to investigate a "whodunnit" in a village of twelve families somewhere in the Ghanaian jungle. The investigation, however, becomes increasingly complex, and Kayo's discussions with Opanyin Poku and Oduro, residents of the village, are told through a web of story and palm wine. The story within the story explores the mysterious, employing Ghanaian proverbs and ancestral wisdom. In the narrative of Opanyin Poku, we read: "Ei, wonders will never cease. They say nothing is other than what you see, but it is also true that nothing is other than what you don't see." It would be easy to state that the demonstrative differences of rural versus metropolis, East versus West, and rational versus ethereal are the basic tenets of this book, but that would be doing this publication an injustice. Tail of the Blue Bird reminds us that, although events may be rationalized, explained as "fate," or accepted as the unknown doings of ethereal forces, the universal fact remains that as humans, we all pass through them, live and endure them; whatever our cultural or philosophi­cal stance, we survive life's events to greater or lesser degrees. It just occurred to me that I run dozens of workshops every year and I - as a rule - participate in the exercises that I use but rarely go back to them. Well, I've decided to share them: short summaries of the exercises, followed by my output - mostly terrible, but, I guess, they show what writing evolves from. Exercise: The alphabet stop - I ask someone to say the alphabet in their head and another to stop them, whatever letter is the 'STOP' letter becomes the first letter of words contributed by everyone in the workshop. In this case, the letter was 'T' and the task was to use all the words that came up in two and a half minutes, which, I can assure you is both too little and too much. I don't think I need to mark out the 'T' words, but the aim of the exercise is to force the writer to manoeuvre around an odd selection of words and still deliver something close to a coherent narrative. The result is often odd, but often contains an exquisite seed of quirky brilliance that can form the basis of a more crafted piece of work. I first used this in 2003, partly inspired by an exercise used by fellow poet, Ainsley Burrows. The temptation the tell the truth fades any time his vanity reigns triumphant; he wants to express his love, but it's torture for him to lose control and let her know. Tonight, like every other, ten out of ten thoughts are about her and his timidity, his tenacity to his independence, is stretching their togetherness taut as a trampoline; with every new trial she tolerates him less and with time he fears she'll see him as a thing that just came to steal her love today to boast about it tomorrow. He wants her to know it's not that way, but every time he tries to talk he tastes his fear and his treacherous pride traces the contours of his face into a tranquil expression that transfers none of his true thoughts to the tunnels of her tympanum.